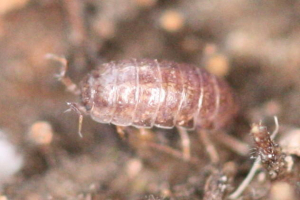 Common Pygmy Woodlouse (Trichoniscus pusillus) ? Observation - Common Pygmy Woodlouse (Trichoniscus pusillus) ? - UK and Ireland. Description: Found on a beechmast while looking for fungi. Approx 2.5mm long, reddish brown. Found on a beechmast while looking for fungi. Approx 2.5mm long, reddish brown.